Robert Taylor was born in Hamilton in 1898, one of ten children born to saddler William Walker Taylor and Isabella Drever. The family lived in Mount Baimbridge Road and Robert attended Hamilton State School. By 1913, the Taylors had moved to Orchard Street, Malvern and Robert began work as a plumber. With the war starting in August 1914, Robert’s elder brother George enlisted on 22 October 1914. He went overseas but returned to Australia in May 1915. 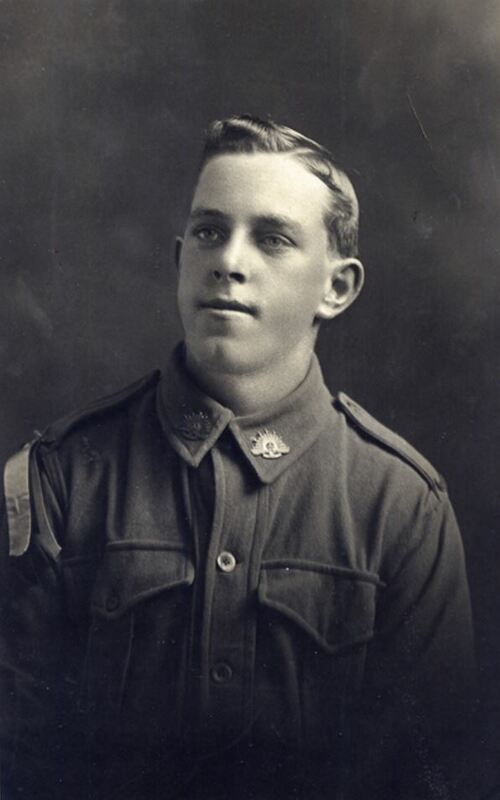 On 24 January 1916, Robert Taylor enlisted at Prahran, just having turned eighteen. He left Australia on 4 April with the 14th Battalion for Egypt, marching into Serapeum on 27 May. They were there only days before sailing for France, arriving at Marseilles on 8 June 1916. After catching a train, the battalion arrived at Bailleul on 11 June remaining there until they moved on to Bois Grenier, considered a training ground for raw soldiers before they faced heavy fighting and was known as the “Nursery Sector”. The 14th Battalion remained in the trenches at Bois Grenier until 11 July when they began to move south, training at stops along the way. Their destination was Pozieres and they arrived on 7 August and went straight into the trenches just as the enemy was mounting a counter-attack. There were heavy casualties among the 14th Battalion although there was some success with Albert Jacka and a small group from his platoon saving men from the 48th Battalion from enemy capture. The shelling continued into the night and into the next day, 8 August. It was during that time young Robert Taylor was killed. His body was never recovered. The death of Robert passed quietly. There were no Family Notices, little communication with the Defence Department by his family and the Grave Registration Report for his memorial at Villers Bretonneux did not carry the name of his parents. The following year, on 29 March another son of William and Isabella Taylor enlisted their youngest Thomas at eighteen years of age. Three months after Thomas enlisted, his father William also enlisted at the age of forty-four on 22 June 1917. “They killed my boys, but I must also go. Men are needed,” he said. 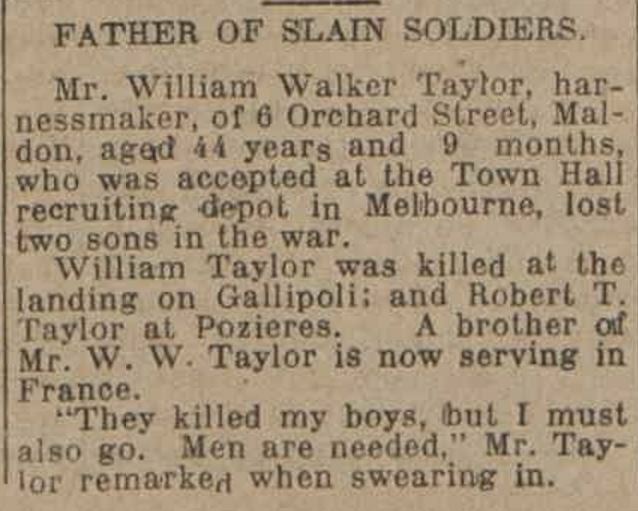 “FATHER OF SLAIN SOLDIERS.” The Bendigo Independent (Vic. : 1891 – 1918) 27 June 1917:<http://nla.gov.au/nla.news-article221060401&gt;. Thomas Walker left for Egypt with the 4th Light Horse Regiment during September arriving in December. Meanwhile, William left on 21 November with the Field Company Engineers for Egypt and then on to England. Just as William was preparing to leave for France, Thomas was killed in Palestine on 2 May 1918. William was only in France a matter of weeks when he contracted trench feet and eventually returned to Australia. Robert’s name is on the Malvern War Memorial along with that of his brother Thomas.